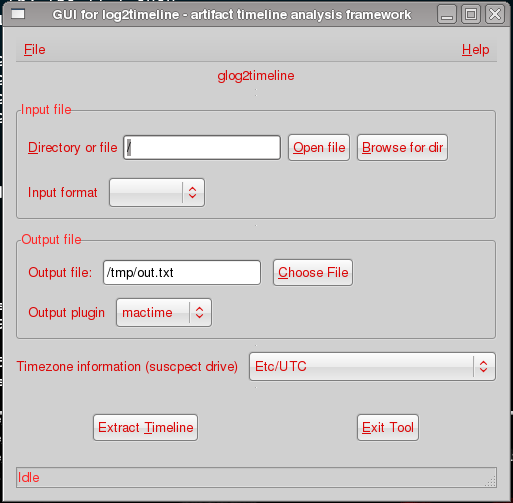 log2timeline is a framework for artifact timeline creation and analysis. The main purpose is to provide a single tool to parse various log files and artifacts found on suspect systems (and supporting systems, such as network equipment) and produce a body file that can be used to create a timeline, using tools such as mactime from TSK, for forensic investigators. GUI has been written in Perl-GTK2 for creating the timeline. Since the GUI is written in GtK2 it will not work on every OS. It has been tested to work on both Linux (tested on Ubuntu) as well as on Mac OS X (tested on Mac OS X 10.5 and 10.6 with X11 installed and Macports to install dependencies).